Don't miss the next tour of the Hill District in 2019! 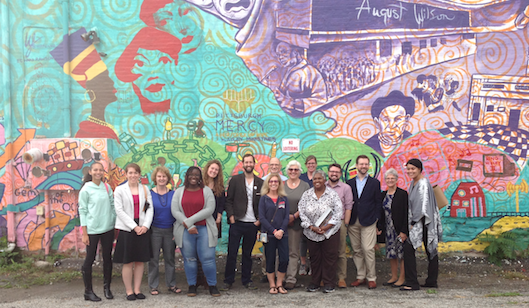 Offered annually, this event helps faculty to learn about one of our closest neighborhoods, the Hill District, as a means to understand the social context, history, assets, and agendas of a community in which so much of our communtiy-University engagement occurs. The excursion is led by community leaders, with stops to visit a variety of organizations and initiatives. On the excursion, you will meet community partners onsite at their agencies and hear their thoughts on navigating agency-faculty partnerships, preparing students for partnership and providing service, and mutually discovering the agendas that will be served. To register for the 2019 Excursion, please send an e-mail to cetr@duq.edu.